Check out the Sunday Coupon Preview to see what is coming! If you are not getting the paper, this would be a great week to start! 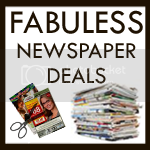 Check out our Idaho newspaper deals! P.S. Look for Albertsons Doubles in this Sunday’s paper! Thanks Amy!